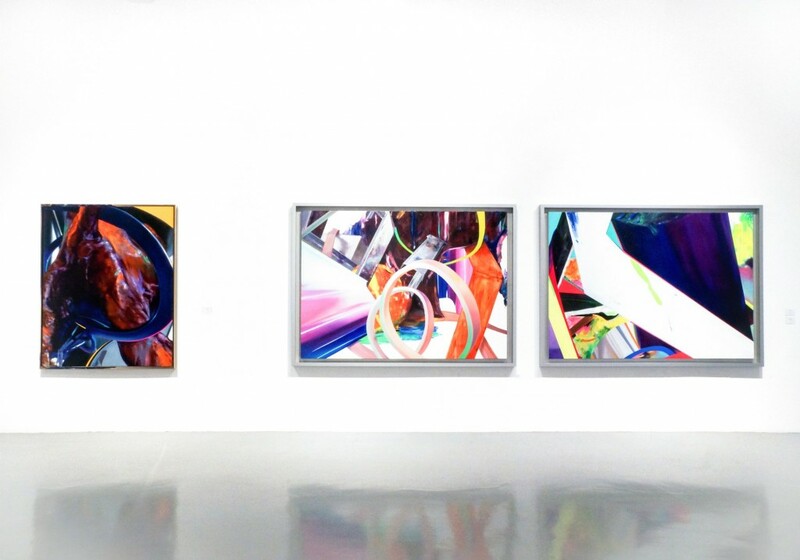 Mizuma Gallery presents Mizuma Conversations, a series of in-depth interviews with featured artists. To kick start, we’ve got Shen Zhenglin, whose solo presentation is currently on view at our Singapore gallery. We discuss more with him on his early exposure hanging around art studios as a child, receiving his training in both China and Korea, his extensive travels from East to West in search cultural evolution within geography, and last but not least, his first solo exhibition in Singapore, VIRTUAL SANCTUARY. Read the full interview with Shen Zhenglin here. In VIRTUAL SANCTUARY, his first solo exhibition in Singapore at Mizuma Gallery, Shen Zhenglin showcases a selection of works from 2014 to 2018. 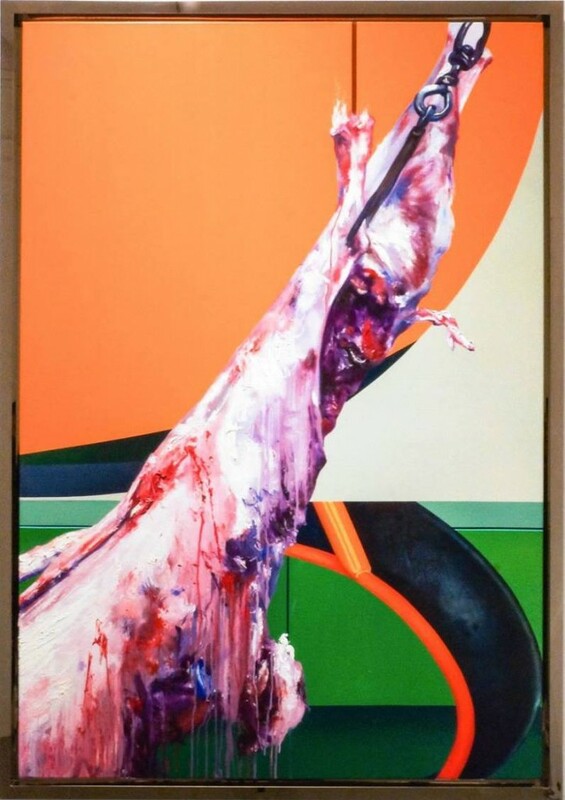 Having received his training in classical painting at Shenyang’s Lu Xun Academy, Shen Zhenglin’s path into abstraction is rooted in the belief that his paintings should be treated purely as a visual language. 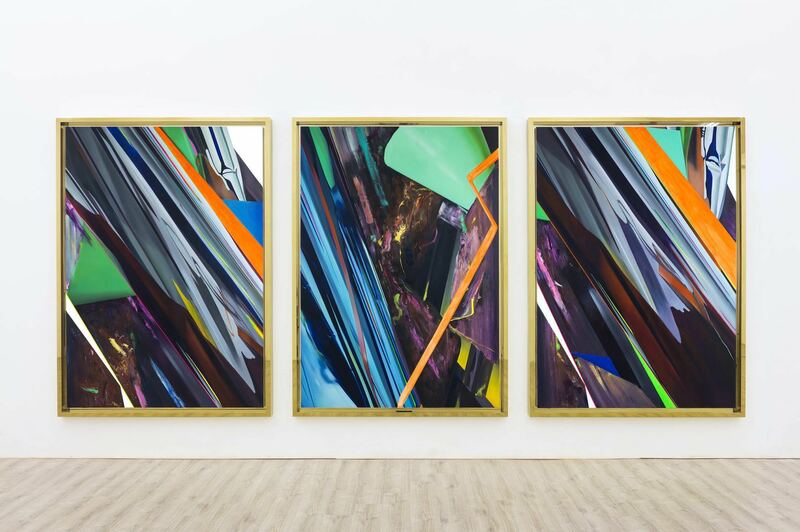 One should navigate through its technical aspects of colours, lines, forms, and its use of the spatial composition, for the paintings to evoke a sense of power and energy. 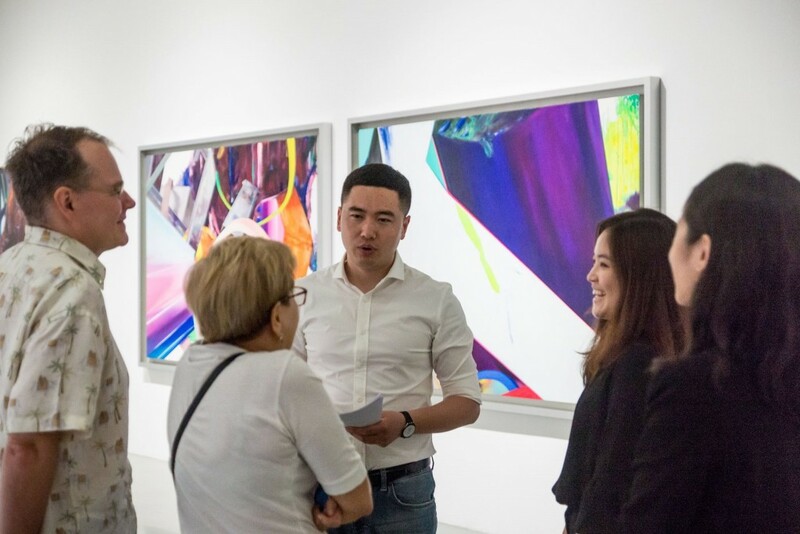 Shen Zhenglin brings to his VIRTUAL SANCTUARY connections to expressionism combined with his meticulous observation of forms and colour, to produce a vague figurative presence in which one is not able to meaningfully decipher much representational association. With his newest painIng series of classical sculptures washed in a dark contemporary colour representative of its artificial background and exhibited alongside much brighter and bolder paintings, the apparent dichotomy in his practise between abstract and gestural is no longer pertinent. The discussion in this series does not revolve around the subject matter of his paintings, but rather how the studies of the form affect us. 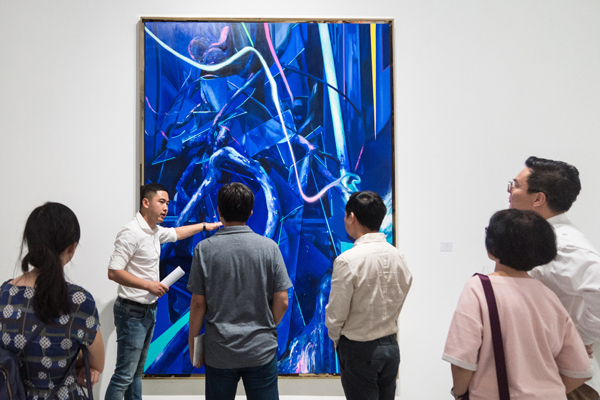 As an artist and avid music listener, Zhenglin draws inspirations from the social conduct of the Middle Ages, the portrayal of religion and dictatorship, the modern architectures and contemporary spaces that surround us today, and finally, to the pursuit for what awaits in the far-out future dimensions of supernatural landscapes. Though in-depth discussion about each painting remains elusive, we see the primary essence of each painting lying within its capacity to evoke a certain energy in the viewers. Mizuma Gallery (MG): Hello Zhenglin. You have completed your BA in Oil Painting from Lu Xun Academy of Fine Arts in China, but spent a year in South Korea for exchange programme. How did your exposure to both academies influence your approach to painting? Shen Zhenglin (SZL): I began studying traditional oil painIng technique in Lu Xun Academy of Fine Arts. In 2009, when I was in South Korea for my student exchange programme, I observed that my new classmates were more focused on the practise of contemporary arts. My time spent at Hongik University in Seoul changed the way I thought about and conceptualised my works. The focus was no longer on painting techniques, but rather on the thinking process. I visited a famous nightclub near Hongik University, and it was my first time in such place. The experience was very significant to me; as I became interested in the way the space (of a nightclub) had conducted itself, especially the neon lights that flashed across the space. Back then I did not know how to speak a single word of Korean. I was in a foreign country and I was unable to speak their language, so I could not understand a single word the lecturer was saying during the class. Using my senses and my feelings, I had to figure out the contents of the lessons. What I find interesting about art is that sometimes we do not require any verbal language to communicate our ideas and thoughts. They can be understood through emotions. That is why I am especially interested in the feelings and emotions that a painting can evoke to the viewer. MG: Your body of paintings seem to have two different styles of abstract and gestural; can you share with us more on your approach to these styles? SZL: In my opinion, I don’t feel like there is a difference between abstract and representational styles. We, as viewers created this distinction of styles. For example, when you look at a particular visual, your eyes tend to try their best to identify or create a link as to what the subject matter might resemble or symbolise, simply in terms of its representational form. Once we are able to identify the subject or elements, we then label the painIng as representational, gestural, or figurative. However, if we are unable to make any familiar association, we categorise the painting as an abstract. But in my opinion as an artist, I think that this categorisation is not important. What is important is how the forms are used to convey a certain feeling or create a spiritual experience. MG: Why do you choose to use gestural figures this time, in your newest series “Mnemosyne”, and not abstract like in your previous series? SZL: I created the two series simultaneously, the flesh abstract series and the gestural series. When I feel a surge of energy or the need for an outburst, I express it through abstract paintings. When I feel the need to relax and take things slow, I go for small gestural paintings from “Mnemosyne” series. In “Mnemosyne”, I chose to mainly use a pure blue colour, which is very soothing for me and allows me to calmly relax. This feeling brings me to a truly honest state of being. I don’t mean to over exaggerate it, but this state of being seems to feel like one of a sincere artist. MG: Your paintings have a varied colour scheme – how do you decide the choice of colours and what do they mean to you? SZL: I do not want to define the meaning of each colour. The colours I have chosen are very contemporary colours. They are most often used in shops and are the most familiar to us. But if I have to define the reason as to why I chose the particular colours and what they mean to me, I will have to start with my blue series. The colour blue is non-existent in the natural world. It is an artificial colour. We see them in places like the neon lights in nightclubs or signs or the screens of our electronic gadgets. They are artificial, man-made colours. Also, metallic colours were created in the age of consumerism. This may give the viewers a gateway to understanding my paintings. MG: As your paintings border a gestural style, how are these elements meant to be represented in your work? SZL: While an artist creates a piece of work, they may not see what others see. Even in the same environmental setting, they may not have the same experience as the next person. They will only notice what is important or interesting to themselves. For example if we were to observe a person, we will notice the entire body, but for an artist, he/she will see how the wind shape the clothes on the body and the distinctive curves of the body. This is the difference between an artist’s and a non-artist’s observations. MG: How have your travels influenced your approach to painting? SZL: This is quite a long story. I love to travel to different places to experience different cultures as well as to learn about the developments of the cultures. One of the first few countries I have been to was France, particularly Paris, and I stayed there for about half a year. I have been to most parts of Europe. I have been back to Europe a few times to explore other places, and then to Japan. I feel that it is a good experience exploring these places as they are very different from back home. I have been trying to find a connection between cultures, so I went to Dunhuang in Gansu Province, China. The reason to explore this particular place was because geographically Dunhuang is located in the center of the Silk Road, a main hub that connects several different cultures. 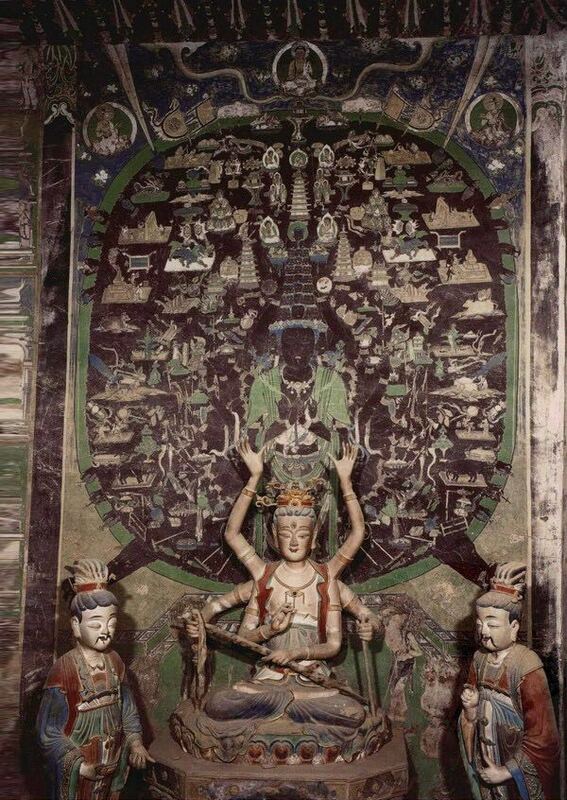 Observing the stone murals of Dunhuang, we can clearly see the influence of Afghan culture. 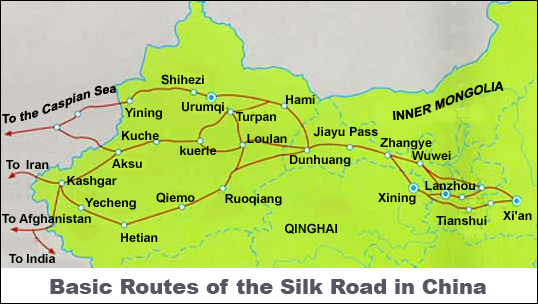 From Afghanistan to Xinjiang and Dunhuang, moving to the central region and eastern coastal areas of China and to Japan — through these routes, the cultures have all been influenced by each other. From this, we can say that the cultures of the world is like one big circle. I am very interested in the way cultures evolve, and the topic of my current exhibition is about how myths were created and evolve, which is why I research on them extensively. In a few days’ time, I will be flying to Cambodia. My main purpose of this trip is to research on how the cultures evolve in Southeast Asia and I am looking very much forward to this trip. MG: In your works, you address the idea of mythology – how did this choice of topic start? SZL: When I was little, I lived in my grandmother’s house, which was a two-storey house. I would often climb to the rooftop to look at the stars. In fact, I have been very curious about things beyond the natural world. As time goes by, this interest grew stronger. That was how I became interested in how myths were created. MG: How did your grandmother influence you in your journey of being an artist? SZL: My grandmother taught me to paint since I was 4 years old. I was a very mischievous and active boy then. She used to say that a boy ought to have patience and focus in whatever he does. However, she did not have the intention to groom me to become an artist. I remember the assignment she gave me, which was to use Chinese ink to draw long strands of hair, starting from the lightest colour, to the medium, and lastly, the darkest colour, coating the entire paper black. I had to complete this assignment every day before I was allowed to go out to play. In the beginning, I just wanted to complete the assignment so that I could play. As time went by, my grandmother discovered my talent for painting. She brought me to many teachers hoping that they could teach me how to paint. There is actually an interesting story. I was a small and very playful boy, so my teacher told me, “You are not allowed to use any painting materials. Just watch me while I paint.” So, he brought out a stool for me to stand on and watch him paint. I was really upset as I could not paint at all. Hence, I went back home every night to paint to safisfy that urge. My grandmother must have suggested that teaching method to my teacher. Knowing my personality, she knew I would feel more motivated to draw. By remembering the painting that my teacher drew in the day and recreating it on my own at night, I trained myself to have a photographic memory. I have been painIng every day since then, and there was not a day that went by where I did not do so. There were many challenges throughout my journey to be an artist. My grandmother felt that men should not be artists but rather businessmen or politicians — those are considered good careers in China. Being an artist was not a good path to take. I faced a crossroad when I was given a chance to choose my University course. My family disapproved of my passion for drawing. When I was a kid, I would leave my Mathematics textbook at the park where I would visit everyday just to draw. I would then wrap up the book in a plastic bag and bury it under a tree before I leave for home. It was some time later that my mother found out about my secret trips as I often returned home late, but she has never confronted me about it. It was when I had to make an important decision while applying for a University course did she reveal it and strongly encouraged me to pursue what I like. This made a huge impact on me. Since then, I have never once doubted or regretted my choice. I have been painting and drawing relentlessly and enjoying the process thoroughly. MG: Are you particularly interested or influenced by sound and music? If so, how does it affect your work in any way? SZL: Music plays an integral role in my art making process – namely classical and electronic music. My favourite electronic musician is Daft Punk, who has significantly influenced many of my works. I also enjoy music from Bach as well as Beethoven, especially his Symphony No. 6 and 7, which was created at the time Beethoven lost his hearing. I really enjoy the feeling of passion and emotion that Beethoven evokes in his composition. Of course, I also enjoy more contemporary music, such as the Icelandic band Sigur Rós whose music evokes a certain ambience and creates powerful energy. Music has been my only companion when I paint. Everyday, I enter my studio, switch on my music, and the day begins. Hence, music plays a very important role in my art-making process. One of my favourite works, “Parvathi” which is currently exhibited at Mizuma Gallery, was done under the musical influence of Bach. This affected the strokes and colours to be very expressive. MG: How does the framing play an integral aspect in your paintings? 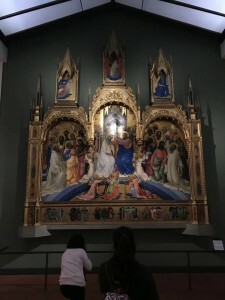 SZL: I have been researching about and studying the Middle Ages paintings. 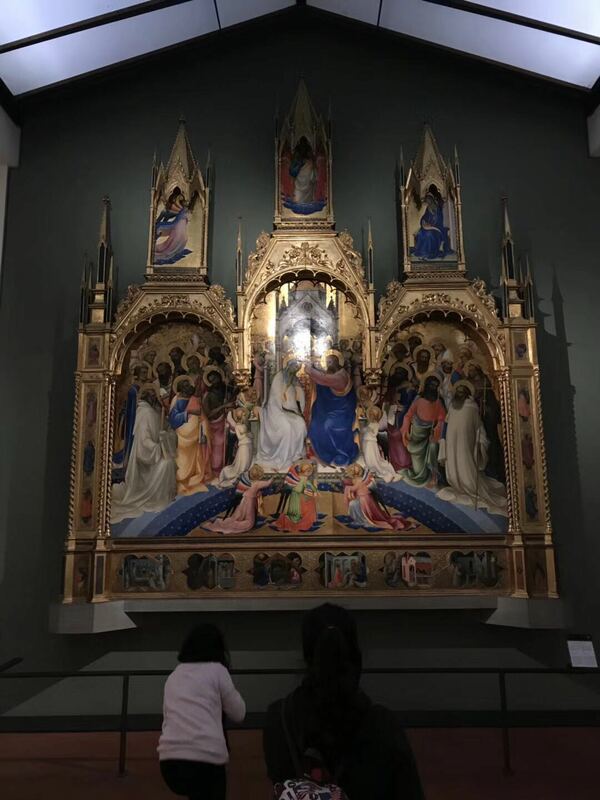 If we look at The Coronation of the Virgin (Picture 1), a triptych painIng found in a Catholic church, the gold frame has a very elaborate design, evoking a holy and spiritual feel to the painIng. 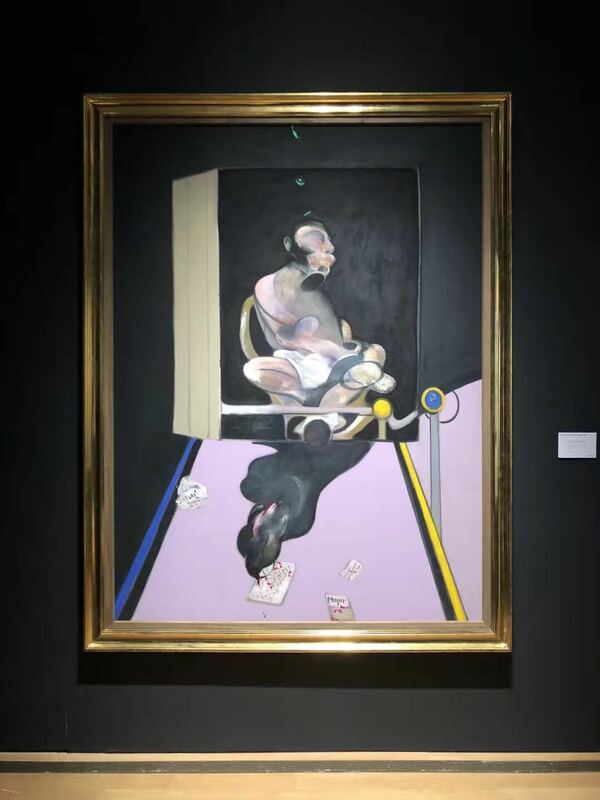 When we move further in time, we can see here in Francis Bacon’s Study for Portrait (Picture 2) that the design of the frame has evolved. It is now of a much simpler, gold leaf-plated, modern design. In my works, The Best View of Heaven is From Hell (Picture 3), the frames I have chosen is of a contemporary design, similar to the second image. And I have chosen the colour gold not only to provoke a similar spiritual feeling as the first reference image, but also gold is a material that is common only in the contemporary times. MG: How do you usually begin each painting- does it start with a sketch followed by composition, or do you just work intuitively? SZL: From the moment I begin, I usually have a certain idea in mind. For instance, when I witness a certain imagery that triggers a kind of emotional response, I might incorporate this imagery in my works. As a matter of fact, I am mostly able to visualise whatever I am going to draw. When I shut my eyes, the final painting appears in front of me. This may sound odd, but it is actually the process most artists go through. My job then is to transfer whatever I see onto the canvas. Of course, they can never be exactly what I imagined. The process does not always turn out to be accurate or foolproof; I have produced many failed pieces. Whatever the artist does, he is destined to “born to fail”. But amidst each failure, we continuously search for other possibilities. Our work is not produced from success, but rather from real experiences reaped from failure. MG: How long does it usually take you to complete one painting? SZL: As for the duraIon of my art-making process, some take half a month to complete, while some take as long as three years. 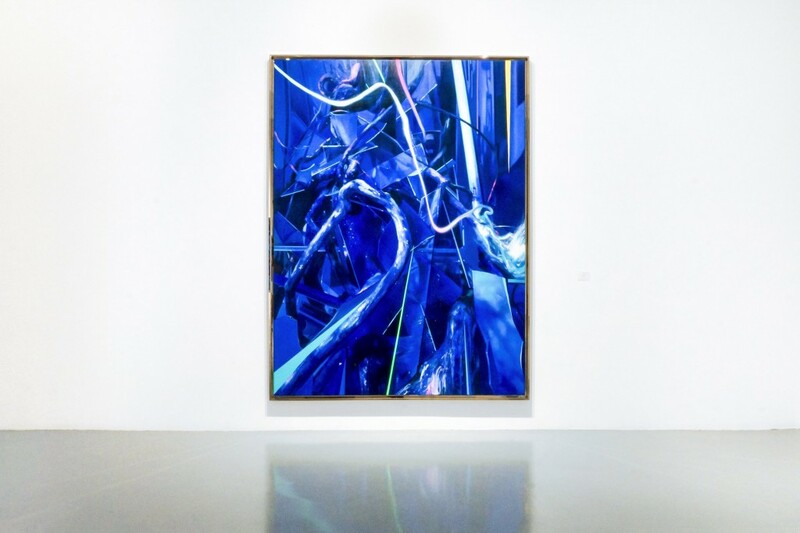 If you look at the biggest blue painting – Eunzv, it took me two years to complete, as it involved multiple layers, with each shade of blue applied one at a time. Hence, such pieces require a long duration. MG: Do you work on each continuously, or several pieces simultaneously? SZL: There are many pieces in my studio that I work on simultaneously as they involve continuous adjustments as a work in progress, hence they take some time to be completed. VIRTUAL SANCTUARY, solo exhibition by Shen Zhenglin runs till Sunday, 24 June 2018.